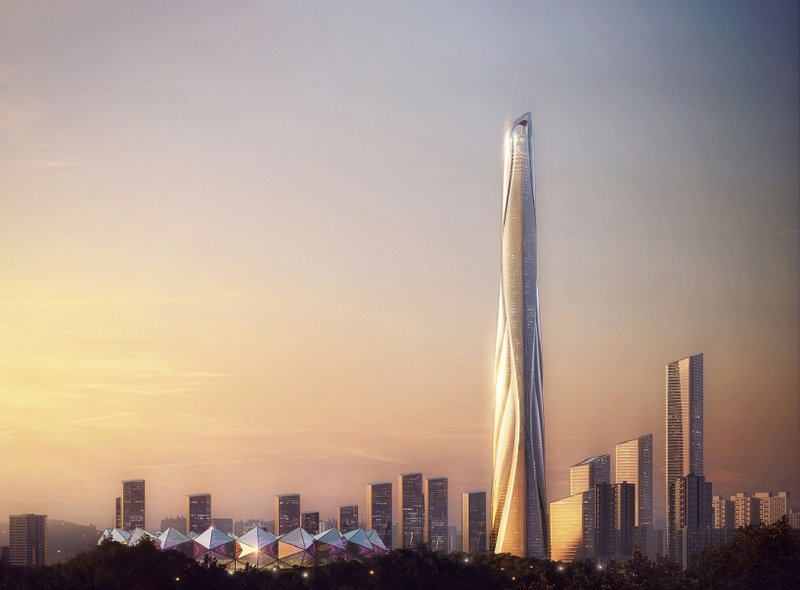 adrian smith + gordon gill architecture (AS+GG) has unveiled plans for a skyscraper in shenzhen, which, if realized, would become the tallest building in china and one of the tallest in the world. named the ?shenzhen-hong kong international center?, the tower forms part of a larger development ? known as the ?shimao shenzhen longgang masterplan? ? that AS+GG has been selected to complete. ?the graceful new tower references anthropomorphic characteristics, offering a new sculptural icon for northwest shenzhen?s skyline,? says the design team. conceived by AS+GG as the focal point of the site, the tower will climb to a total height of approximately 700 meters (2,297 ft). the burj khalifa, the world?s tallest building, is 828 meters in height (2,717 ft), while the tallest building in china ? the shanghai tower ? tops out at 632 meters (2,073 ft). the shenzhen-hong kong international center will feature one of the world?s highest observation experiences as well as a restaurant, a night club, spa services, and a grand swimming pool. in the evenings, the tower itself will be a visual, sound, and light show.